Abbreviation for high-frequency oscillatory ventilation. 1. The movement of air into and out of the lungs. 2. Circulation of fresh air in a room and withdrawal of foul air. 3. In physiology, the amount of air inhaled per day. This can be estimated by spirometry, multiplying the tidal air by the number of respirations per day. An average figure is 10,000 L. This must not be confused with the total amount of oxygen consumed, which is on the average only 360 L/day. These volumes are more than doubled during hard physical labor. A noninvasive type of artificial ventilation that relies on displacement of the abdominal contents to move the patient's diaphragm. A mode of mechanical ventilation in which the minute ventilation is not allowed to fall below a set threshold (e.g., in adults, below 100 ml/kg/min), but the inspiratory pressure, inspiratory time, and tidal volume are all adjusted by the ventilator to the patient's needs. A type of mechanical ventilation in which patients breathe spontaneously at any phase of the ventilator's duty cycle at high continuous positive airway pressures (CPAP). 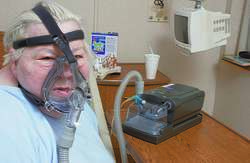 Periodically, the level of CPAP is lowered to eliminate waste gases from the circuit. The movement of air into and out of the alveoli. It is a function of the size of the tidal volume, the rate of ventilation, and the amount of dead space present in the respiratory system. It is determined by subtracting the dead space volume from the tidal volume and multiplying the result by the respiratory rate. A type of mechanical ventilation with a minimum frequency of respirations determined by ventilator settings. It also permits the patient to initiate ventilation at the same tidal volume or pressure as set on the ventilator. In emergency cardiac or critical care, the administration of artificial breaths to a patient that are timed independently of chest compressions. A method of mechanically assisted pulmonary ventilation. A device administers air or oxygen to the lungs under a continuous pressure that never returns to zero. The use of different ventilatory strategies in each lung in a patient with focal lung disease, e.g., a patient undergoing surgery to remove a tumor in one lobe of a lung but not another, or a patient with more severe COPD on one side of the chest than another. This technique requires a double-lumen endotracheal tube. Mechanical ventilation initiated by either a change in airway pressures or by a change in gas flowing through the ventilator circuit. Dual control is asserted when pressure limited breaths are delivered and the pressure changes from breath to breath to meet a desired delivered tidal volume. It improves the coordination between the patient's respiratory efforts and machine-generated breaths. A type of ventilation that continuously ventilates at 100 to 150 cycles/min. It is used in respiratory failure to provide continuous ventilation without the side effects of positive-pressure ventilation. Pulmonary ventilation with multiple rapid breaths given at small tidal volumes. It limits the stretching and collapse of the alveoli that occur in conventional mechanical ventilation. Mechanical ventilation that decreases peak and end-expiratory pressure by delivering hundreds of shallow (low tidal volume) breaths per minute. It is a time-cycled, pressure-limited mode of ventilation. Machine ventilation that delivers pressurized breaths at intervals while allowing for spontaneous breathing. A mechanical method of assisting pulmonary ventilation, using a device that inflates the lungs under positive pressure. Exhalation is usually passive. Mechanical ventilation in which the normal temporal relationship between inspiration and expiration is reversed (the inspiration time is longer than the expiratory time). It is sometimes used in severely hypoxemic patients who have not responded to other ventilatory maneuvers. Because it is uncomfortable for patients, paralysis and sedation are needed. A ventilatory technique used to treat both premature infants with surfactant-deficient lungs and adults with acute respiratory distress syndrome. Ventilatory support that provides mechanical breaths when the patient's spontaneous breathing does not achieve the preset mechanical ventilatory rate. The normal maximum breathing pattern that can be maintained for 15 min (usually approx. 60% of maximum voluntary ventilation). The maximum amount of gas that can be ventilated into and out of the lungs in a voluntary effort in a given time, measured in liters per minute. Any form of artificially supplied ventilation. The use of airway support administered through a face (nasal) mask instead of an endotracheal tube. Inhaled gases are given with positive end-expiratory pressure often with pressure support or with assist control ventilation at a set tidal volume and rate. Numerous studies have shown this technique to be as effective as, and better tolerated than, intubation and mechanical ventilation in patients with exacerbations of COPD. Mechanical ventilatory support that applies positive pressure to the airway. The objectives include improving pulmonary gas exchange, relieving acute respiratory acidosis, relieving respiratory distress, preventing and reversing atelectasis, improving pulmonary compliance, preventing further lung injury, and avoiding complications. Positive-pressure ventilation can be life saving, but complications such as toxic effects of oxygen, laryngeal injury, tracheal stenosis, alveolar injury, barotrauma, pneumonia, and psychological problems may occur. A type of assisted ventilation that supplements a spontaneous breath. The patient controls the frequency and the duration and flow of inspiration from the ventilator. A type of mechanical ventilation in which tidal volumes are set to avoid overstretching the alveoli, and pressures at the end of an inhaled breath are set to avoid alveolar collapse. The inspiration and expiration of air from the lungs. Periodic assisted ventilation with positive pressure initiated by the patient and coordinated with spontaneous patient breaths. An emergency procedure in which a catheter is placed percutaneously through the cricothyroid membrane and attached to a high-pressure, high-flow jet ventilator. This form of ventilation is used for patients with an upper airway obstruction who cannot be intubated. A form of mechanical ventilation in which the peak inspiratory flow rate, fraction of inspired oxygen, positive end-expiratory pressure, respiratory rate, and tidal volume are preset and delivered to the patient. In the second case, the pneumatocele resolved spontaneously within one week of conservative management with HFOV. We suggest a trial of conservative management with HFOV in mechanically ventilated stable patients for two to three weeks. Iki bin sekiz ve 2009 yilinda HFOV uygulanan 14, 2010 yilinda 10 erkendogan bebek vardi. Bununla birlikte HFOV ile geleneksel yapay solutma yontemlerinin karsilastirildigi klinik calismalarda hangi yontemin daha iyi oldugu konusunda celiskili sonuclar bildirilmistir (7,8). Of the six patients who did not respond to APRV, four patients could not undergo HFOV due to circulatory instability and two patients due to excessive barotrauma. The median time on CMV or APRV prior to HFOV was 9. The literature on HFOV in neonates wanders all over the place. HFOV versus CMV has been subjected to several meta-analysis. For units in which there is a view that HFOV is a useful therapy and will form the basis of respiratory rescue, the procurement of two units should be considered. High frequency oscillation in the adult intensive care unit. Nearly mainstream? HFOV settings and arterial blood gases were assessed at 4, 8, 12, 24, 36 and 48 hours after commencement, then daily thereafter until HFOV was ceased. Mean airway pressures (Pmaw) produced by HFOV are normally quite high and remain constant throughout active inhalation and exhalation. Low volumes with high MAPs are characteristics that craft HFOV as the archetypal lung-protective ventilatory mode.